After Mizoram, BJP seems to be in crisis in Meghalaya. One of the two BJP legislators in Meghalaya has threatened to resign from the party if the controversial Citizenship (Amendment) Bill is passed by the Rajya Sabha. Former deputy speaker Sanbor Shullai, who switched from NCP to BJP, has written to Prime Minister Narendra Modi, stating that he would leave the party within one month if the bill is passed in the Rajya Sabha. 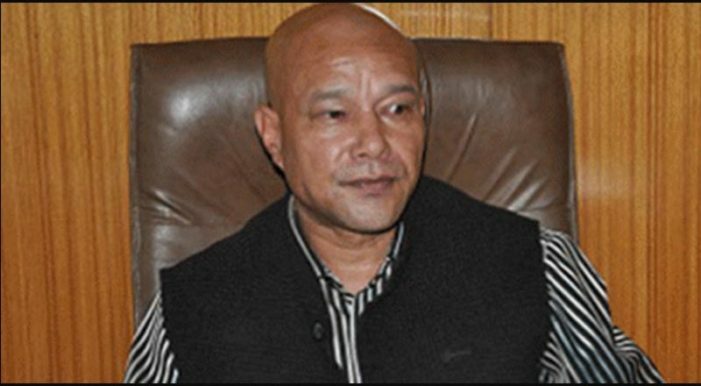 “…Considering the outcome of the proposed Bill I have left it to the wisdom of the people of my state and have decided to leave the party within one month in the event if the proposed bill is passed in Rajya Sabha without taking into consideration the opinion of the people of my state Meghalaya and the people of the Northeastern region,” the South Shillong legislator mentioned in the letter. MLA Shullai further said that during a continuous meeting in his constituency around 10,000 party supporters had informed him that they would resign if the Northeastern state including Meghalaya is not exempted from the implementation of the Bill. The BJP is part of the NPP-led government in Meghalaya. 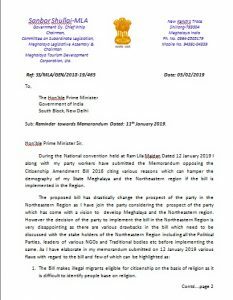 The letter also reminded PM Modi that during the BJP National Convention at Ram Lila Maidan, New Delhi on January 12, Shullai along with party workers have submitted the memorandum opposing the Citizenship Bill citing various reasons which can hamper the demography of Meghalaya and the Northeastern region if the bill is implemented. “The proposed bill has drastically changed the prospect of the party in the North Eastern region as I have joined the party considering the prospect of the party which has come with a vision to develop Meghalaya and the North Eastern region. However the decision of the party to implement the Bill in the North Eastern Region is very disappointing as there are various drawbacks in the bill which need to be discussed with stakeholders of the region including all political parties, leaders of various NGOs and traditional bodies before implementing the same,” Shullai said while elaborating in his memorandum submitted January 12 various flaws with regard to the bill. Stating that the Bill makes illegal migrants eligible for citizenship on the basis of religion, Shullaid said that it would be difficult to identify people based on religion. He said that Meghalaya and Northeast as a whole do not have proper international boundary and many boundaries of the state are easily accessible by Bangladeshi illegal migrants. “The Ministry of Home Affairs has issued a statement to the effect that the approval of any application applying for citizenship under the Bill will be subjected to the approval of the concerned State authority. However, rejection of any application by the authority would invite, and unnecessarily opens doors for litigation once the Bill becomes a law,” Shullai said. The letter was also forwarded to BJP national president Amit Shah, Union home minister Rajnath Singh and Meghalaya state BJP president Shibun Lyngdoh. At a rally at Jaïaw on January 31, where over 40 thousand people gathered to oppose the Bill and to demand for implementation of ILP, Shullai had vowed that he would resign from the BJP if the Bill is not withdrawn. The Lok Sabha has already passed the Bill and it is likely to be tabled in the Rajya Sabha on February 12. Mizoram BJP chief John V Hluna on February 5 threatened to dissolve the party’s state unit if the national leadership goes ahead with the passage of the Bill.